Claudia F included in an art project about non-binary people and their stories. I am very proud to announce that I have taken part in a beautiful art project about non-binary people and their stories. I met the photographer Daniel Barter through a common friend and he asked me if I was interested in taking part in his project about trans, non-binary and gender fluid people and they stories. 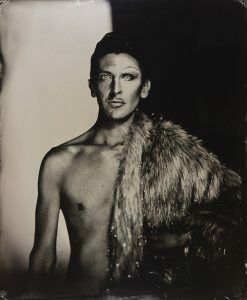 Daniel uses a very particular technique where he takes the photos and then imprint them on glass; during the process some questions are asked to all the participants about their stories, background and what does entail for them being part of the queer part of society. The answers are then recorded for everyone to listen to. All the pictures are now on display in Cardiff at the Eden Project. ← Previous post:Next gigs coming!!! Quay Pride and Central Station!